I originally saw The Terminator during its theatrical run in 1984. At the time, I thought it was a pretty terrific action movie, with lots of exciting sequences and a creativity that clearly rose above its origins as a low budget film. I watched it again when it came out on video and that was it for a while. When it came out in 1991, Terminator 2: Judgment Day also made a very strong impression on me. At that time, I had just started to collect laserdiscs. Even though I hadn't seen the first film in many years, I had positive memories of it so I figured it was worth a purchase. In retrospect, Terminator didn't hold up too well for me. It wasn't that anything about it was particularly problematic, but the problem arose from the fact that I had seen the sequel. In my opinion, T2 outdid the first movie in virtually every way and this meant the original looked tame and dull by comparison. How can you go back to the farm when you've seen the bright lights of gay Paree? At this point, you're probably thinking, "Wasn't this supposed to be a review of Reservoir Dogs?" Sorry for the confusion, but I told the preceding story simply to illustrate a point: frequently our impressions of films become substantially different because of other movies we've seen in the interim. Which - finally - leads me to Reservoir Dogs. I'd heard a lot of positive comments about it over the years, but I missed it during its theatrical engagement, and I'm not much of a renter, so it took me a while to actually see it. What prompted me to finally do so was the success of director Quentin Tarantino's second film, Pulp Fiction. That one I did view during its theatrical run, and I liked it very much, enough so that I finally rented Reservoir Dogs back in the 1990s. When that occurred, I thought that Pulp Fiction was a much better movie. Both films feature a long list of similarities: story told in very nonlinear way, many pop culture references, witty but frequently crude dialogue, graphic violence, etc. However, Pulp managed a more compelling story, better acting, and much more variety than the fairly static Dogs. I couldn't help but feel that Dogs came across as something of a dress rehearsal for Pulp. Which is why I wish I'd seen Dogs before I took in Pulp. In truth, Dogs really is a good movie but it clearly would have made a much greater impression on me if I'd not already had a crash course in Tarantino. Might that then have caused Pulp to seem less compelling than it did in 1994? Perhaps, but I doubt it. I think that Pulp progresses from Dogs, so I could have appreciated it from the point of view of someone watching a director develop. In any case, Dogs does work pretty well on its own. Its main fault stems from the fact that it possesses a tremendously thin narrative. In fact, there really isn’t any plot. Ostensibly, it's about a jewel heist, but we never see the robbery itself and we observe its immediate aftermath only through brief flashbacks. No, the purpose of the film really is to provide as many of Tarantino's now-patented dialogue exchanges. Dogs is a very talky movie, in which little actually happens, except for a few very notable moments. Not that this is a bad thing; when the dialogue is as good as that which Tarantino can write, big action scenes aren't necessary. Still, Dogs feels padded to me, even though it's only 100 minutes long. Many scenes seem unnecessarily drawn out and I occasionally grew impatient; I just wanted the story to move along and get where it was going. While that feeling popped up from time to time during Pulp - mainly during the Bruce Willis segment - the impulse was less strong, and it should be noted that Pulp is almost an hour longer than Dogs. Across the board, the cast provides solid acting – except perhaps for Tim Roth's Mr. Orange. Roth struggles with his American accent and he seems over the top to me; I think he just tries too hard. Best of the lot clearly is Michael Madsen. He's tremendously creepy and affecting as the psychotic Mr. Blond, especially in the infamous sequence in which he Van Goghs a cop to the tune of “Stuck in the Middle With You”. Madsen provides a chillingly laid-back portrayal of a seriously spooky guy. In the end, I can't help but feel that while Reservoir Dogs works fairly well, it really is too long. Rarely have I felt so strongly that a director stretched the material to get his movie to feature length. Ultimately, it probably would have worked better as one segment in a movie, ala the three parts of Pulp Fiction. On its own, it provides many positive moments, but it simply takes too long to deliver the goods. 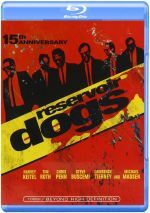 Reservoir Dogs appears in an aspect ratio of approximately 2.35:1 on this Blu-ray Disc. The image seemed good but could’ve been better. For the most part, sharpness worked well, as much of the movie showed nice clarity and accuracy. However, edge haloes created some distractions and made the flick less precise than I’d like at times. No issues with jagged edges or shimmering occurred, and source flaws were minor. I witnessed a smattering of small specks but nothing significant. I suspect some digital noise reduction affected a few scenes – primarily the opener at the diner – but most of the flick demonstrated appropriate grain. Colors seemed positive. Dogs went with a stark palette much of the time, so it didn’t feature a lot of tones. Nonetheless, the elements we got looked solid. Blacks were dark and tight, while shadows delivered smooth material. The edge haloes were the main reason this ended up as a “B-“ transfer. The film’s DTS-HD HR 6.1 soundfield generally provided a forward emphasis and those elements were accentuated with a lot of general ambience. The audio seemed alive with a fair amount of environmental factors, such as the clatter of other diners during the opening restaurant sequence. Music displayed some solid stereo imaging, and the tracks popped to life reasonably well during action sequences. Elements moved across the front channels smoothly and efficiently. Those also added better usage of the surrounds, which then complemented the material fairly well. Music showed nice clarity and range. The songs sounded good, as they demonstrated clean highs and punchy bass response. This wasn’t a particularly ambitious track, but it worked well given the movie’s scope. How did the Blu-ray compare with those of the 2006 15th Anniversary set? Audio showed a little more pep and range, while visuals appeared tighter and more distinctive. Though this wasn’t a great presentation, it improved on the DVD. The Blu-ray includes some of the DVD’s extras but loses a lot of them. Called Pulp Factoid Viewer, this text commentary uses the old “Pop-Up Video” style to throw text and graphics onscreen at times. 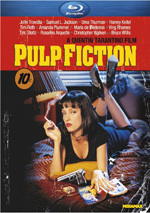 We get notes about Tarantino and his work, the film’s development and production, the cast and crew, music, influences and inspirations, the movie’s reception, connections to other Tarantino efforts, and general notes from the shoot. The breadth of material covered in the “Viewer” makes it sound more effective than it is. In truth, it throws out only a smattering of interesting nuggets. When notes appear, they’re usually decent, but vast amounts of movie pass without information. This makes the track only occasionally involving, since we really don’t get many details across the flick’s 100 minutes. A 2006 featurette called Playing It Fast and Loose lasts 15 minutes, 44 seconds as it features comments from Internet film critic Harry Knowles, Rebels on the Backlot author Sharon Waxman, AFI Conservatory senior lecturer Peter Markham and Loyala Marymount University’s Mark Evan Schwartz. They discuss Tarantino’s skills and the impact Dogs had on films. We get notes about the Dogs notion of “cool” as well as Tarantino’s writing style, his use of violence, and the movie’s legacy. “Loose” offers a decent little piece but not an especially memorable one. In addition, Knowles’ constant reference to the movie as “ResDogs” gets really annoying. For a look at the various movie characters, we head to Profiling the Reservoir Dogs. This seven-minute, five-second featurette examines Mr. Brown, Mr. Pink, Mr. White and Mr. Blond. We get psychological interpretation of the different personalities; we can also read the information via a purely text version. This is an odd but somewhat interesting take on the characters. Five deleted scenes run a total of 12 minutes, 42 seconds. Actually, the disc includes only three true excised segments, as the fourth and fifth present alternate takes of the ear-cutting bit. We find “Background Check” (4:41), “No Protection” (3:00), “Doing My Job” (2:34), “Cutting Off the Ear – Alternate Take A” (1:02) and “Cutting Off the Ear – Alternate Take B” (1:25). The ear-cutting bits are interesting to see but don’t add much. The second of those presents a graphic view of the scene and comes with a warning before you view it. While the scene presents the potential to seem disgusting, in reality it comes across as goofy just because the prosthetic ear looks so fake; I’ve never seen some one slice off another guy’s ear, but I’d guess it’d look a lot scarier than this. The other three scenes seem compelling. The first two concentrate on Mr. Orange’s background as a cop and his preparation for the undercover case, while the third shows Pink, White and Nice Guy Eddie as they drive to take Orange to a nurse. No remnants of that remain in the film. Interestingly, this scene foreshadows Pulp Fiction. It mentions “the Bonnie situation”, which was the third vignette in that film. Indeed, the Bonnie in question clearly is the same one featured in the Pulp scenario. Under “Also from Lions Gate”, we get some Previews. We locate ads for Crank, The Descent, and Saw III. No trailer for Dogs appears here. And that’s not the only loss from the 2006 DVD. The Blu-ray drops a commentary as well as tons of other materials. Please consult the earlier review for a full list – the DVD provides too many now-gone extras for me to spell out all of them. While Reservoir Dogs shows glimmers of Quentin Tarantino’s talent, it suffers from a little too much ambition and a stretched-out storyline. The movie usually remains entertaining and lively, but it seems padded at times. The Blu-ray provides mostly good picture and audio along with a handful of supplements. Although the Blu-ray brings us the highest quality version of the film to date, it doesn’t fully replace earlier DVDs because it fails to reproduce so many bonus materials.